When I first asked for recommendations for the Orlando area regarding this year's vacation, I got several for a place called Hamburger Mary's. I went to the website, and from all indications, it seemed to be a drag/cabaret/karaoke theme franchise restaurant/bar, almost as if the Dumpsta Players opened a place to eat. We made long term plans to go, and asked several folks to join us, however, the best laid plans of mice and fry lovers being what they are, most people had to drop out. Alas, we were competing with Mickey's Not-So-Scary Halloween Party. So The Bride and I, after braving what is known as the I-4 parking lot, met up with Florida friend Terry, who has accompanied a few FFD road trips and even written an entry or two. Hamburger Mary's is in a mini-South Street-like section of Orlando trying to make a comeback called Church Street Station. The Bride and I were stunned at the low price of parking, but that others apologized for it being high because of a nearby event. Wow, I would trade Philly parking rates in a second for Orlando. The first thing that struck me about Hamburger Mary's was how empty and quiet it was. For what sounded like such a partying kind of place was sooo not hopping for a Friday night. I was disappointed. And we were seated right in front of the stage. This could have been so much more. At least we had good company and conversation. 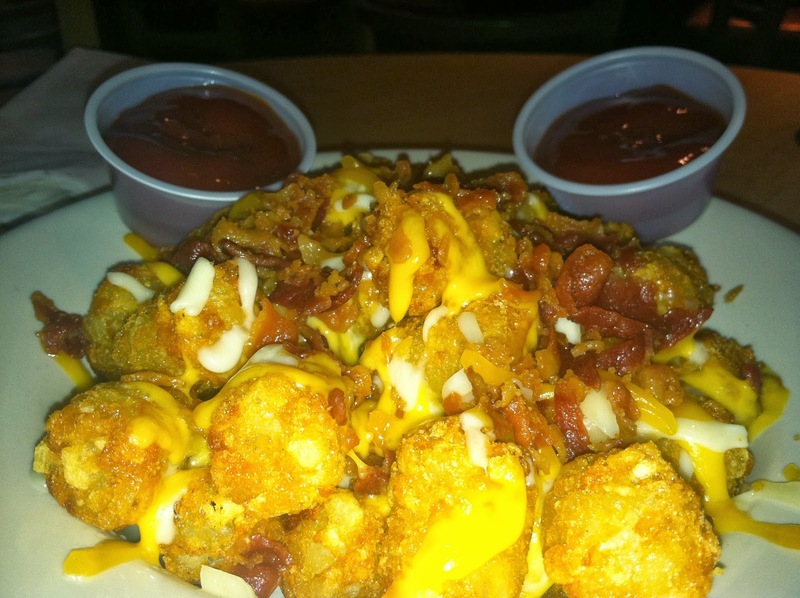 As an appetizer we got the infamous Mary's TA-TAs, and we got 'em loaded. These are assumedly store bought tater tots with real chunks of bacon and cheddar cheese. 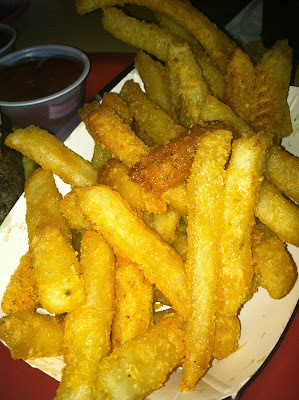 They could have been deep fried, but they weren't greasy, and really had the texture and taste of baked, very soft and tender, with chewy melty cheese. These were a real treat. And can you see the hidden Mickey? I got my usual weapon of choice, a plain burger with fries; Terry got the wasabi burger, which he said he liked; and The Bride got a taco salad that she similarly enjoyed. My burger was great, a big chargrilled half-pounder on an equally big soft sesame seed bun (hard to find these days). It was near perfect, I loved it. 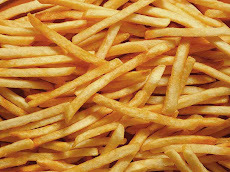 The French fries were regular cuts, battered and crispy on the outside, and deep fried. The taste and texture (though not the shape) kinda reminded me of Ore-Ida Crispers. They were okay, but not great. Although they did get better as time went by. You know that thing where dinner is over but you're still absentmindedly munching? Yeah, they're great for that. I suspect this place is more about atmosphere than food, sadly we didn't really have much atmosphere. If we ever return, we will make sure to come on a night when something is going on other than just the food. I wanted more Dumpstas and less restaurant, I guess. The best part of the meal came with the check, and that in itself was a promise of a better time next time when we do come during an event. 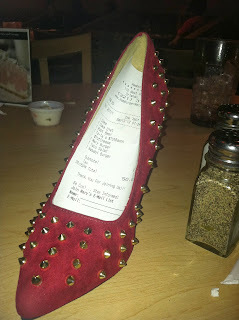 The check came in a red studded high heel, which was totally awesome. Much like a bad movie with a great ending, the heel made the meal. Good time hanging out with The Bride and Terry.